Tragedy struck on Monday when the famed Notre Dame Cathedral, one of the most beloved landmarks in Paris, caught fire. The renowned Gothic church was in the midst of an $180 million renovation. According to the New York Times, around 500 firefighters worked for nearly five hours to control the flames that overtook Notre Dame. The cathedral’s famed spire, built in the mid-1800s, was lost in the blaze, but its two rectangular bell towers, seen as a highlight of the Parisian skyline, were saved. “The worst has been avoided even though the battle is not completely won,” President Emmanuel Macron said Monday night, with a promise that the cathedral would be rebuilt. The cause of the fire is unknown. 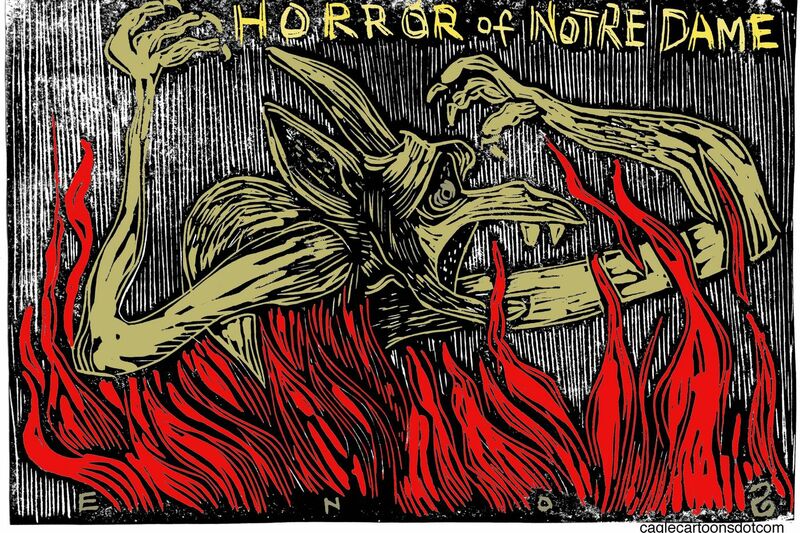 As the world mourns the loss of a cherished structure, built over centuries starting in 1163, editorial cartoonists put pen to paper to memorialize Notre Dame. In 1831, author Victor Hugo gave the cathedral perhaps its most enduring place in popular culture with his novel The Hunchback of Notre-Dame, which features protagonist Quasimodo as Notre Dame’s bell ringer. The hundreds of gargoyles that surround Notre Dame, many of them added in the 13th century, are likely to withstand the effects of the fire and served as inspiration for several artists. Although the cathedral sees about 13 million visitors each year, it remains a sacred place for Christians. Mass is still offered at Notre Dame on Sundays. Our own famed Statue of Liberty was gifted to America by the people of France in 1886.